Image: Screenshot of Audubon.com (Photo shown by Eva Deitch). The academic study of local local ecological knowledge is traditionally done in non-urban settings and in communities in the Global South. I know that urban folks have deep knowledge about the wild plants and animals in their "sacred places" (Hester, 1985) some of which are neighborhood greenspaces. 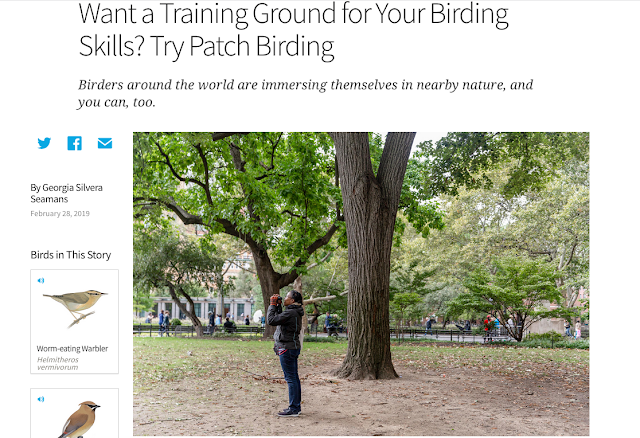 I am looking for funding to conduct a formal ethnography of people who learn about urban nature through birding and botanizing. In the meantime, I write here and where I can about urban forms of local ecological knowledge. I am pleased to share an example of this work published as "Want a Training Ground for Your Birding Skills? Try Patch Birding" at Audubon.com.